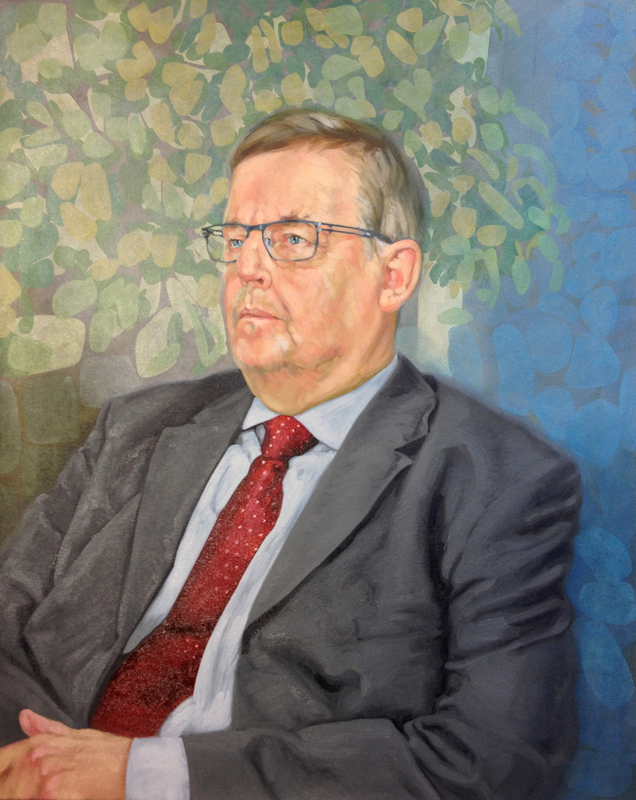 The official portrait of retired Oulu University provost Hannu Pietilä was unveiled and presented to the university collection on April 18, 2013. I had a lovely time working with Hannu Pietilä in the studio. He came to my studio to sit for three sessions. During the first session I was so nervous I didn't speak very much, and he began to fall asleep in his chair. During the other sessions I made sure to have some (not too soothing) music playing, make a lot of coffee and chat more. The project timeframe was from January to April, luckily just as the sun was returning from its northern hiatus. 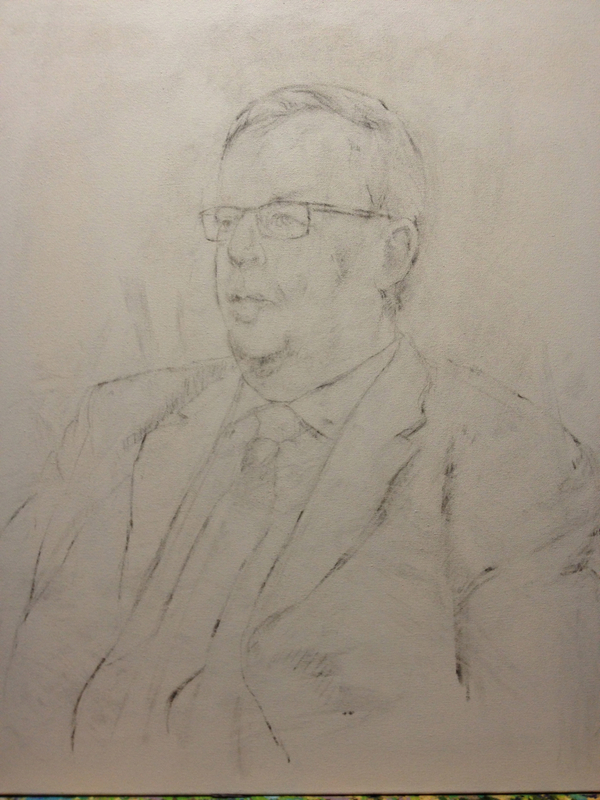 The first session with Hannu Pietilä was focused on composition, background, model placement and underdrawing. I worked directly on the canvas with charcoal. I also took as many reference photographs as I could (it was a somewhat dark, cloudy day, so the lighting wasn't ideal). I corrected the underdrawing for proportional errors, then I beat the heck out of the charcoal with a rag so that there wouldn't be too much charcoal dust tainting the paint. The third photograph is the background shapes and colours being added to the composition. I found inspiration for the shapes from the reference photographs as well as just staring at what's in the studio (a Ficus tree). The fourth photograph is from after I worked on the head to define the shape and features. As this was from reference photographs, you can notice the greying or blanching of the colour palette. Even with the best light and colour balancing in a camera, it can never be a reliable substitute for a live model in natural light. The fifth photograph was taken after the second session with Hannu Pietilä. 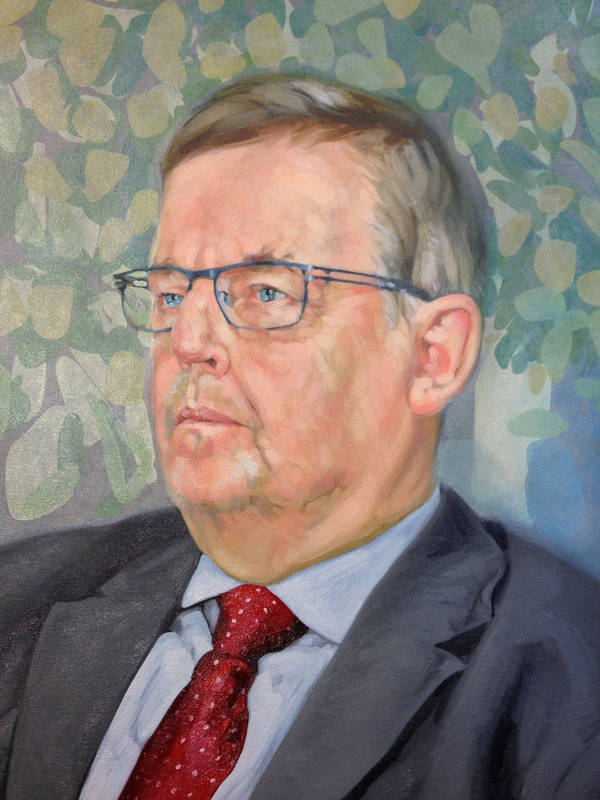 It was then that I realised how grey the portrait had become. 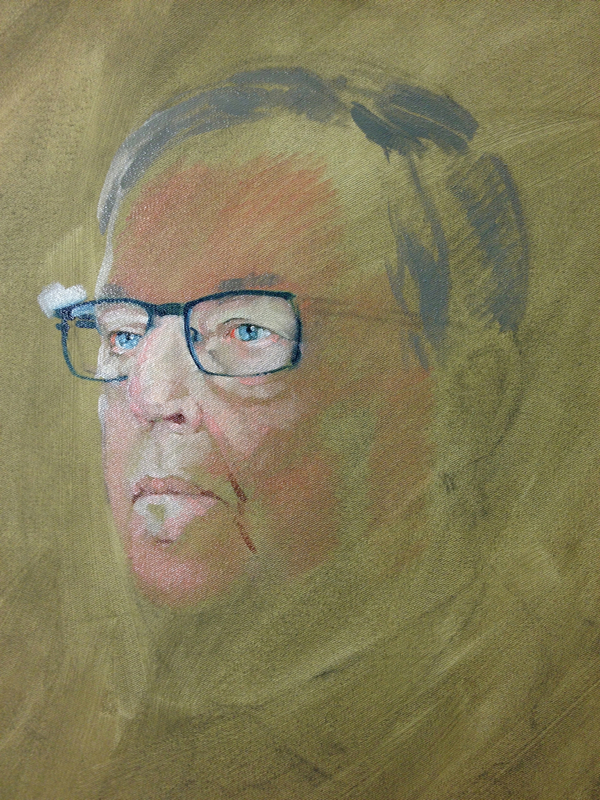 I was caught off guard at how much colour I had lost, and I quickly worked it back into the portrait. The sixth and seventh photographs show the layers of paint that were added in the background and the blocking in of the forms and colours in the suit and tie. By the time of photograph number eight, I had reached an awkward compositional situation. 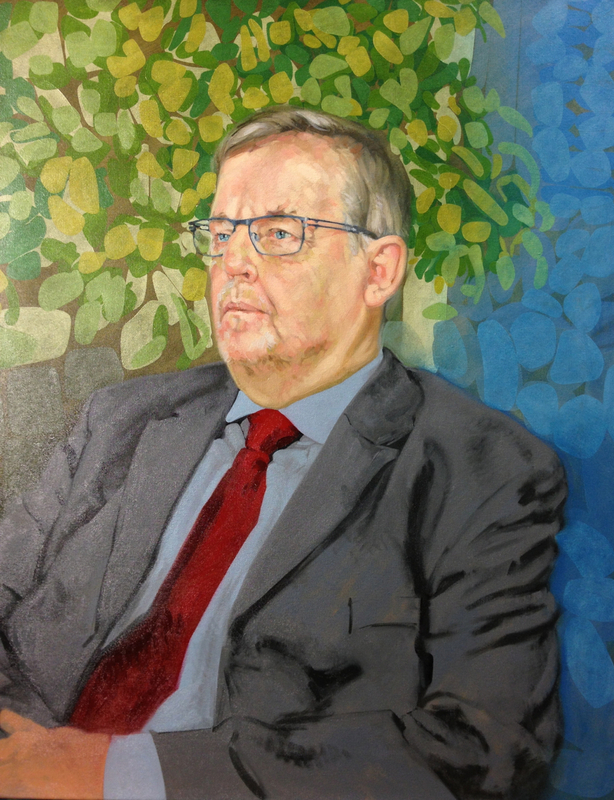 I had proposed and agreed upon with the university a classical head-and-shoulders portrait composition, but I had painted myself into an almost 3/4 portrait composition (which was surprising to me what with the relatively small size of the canvas). 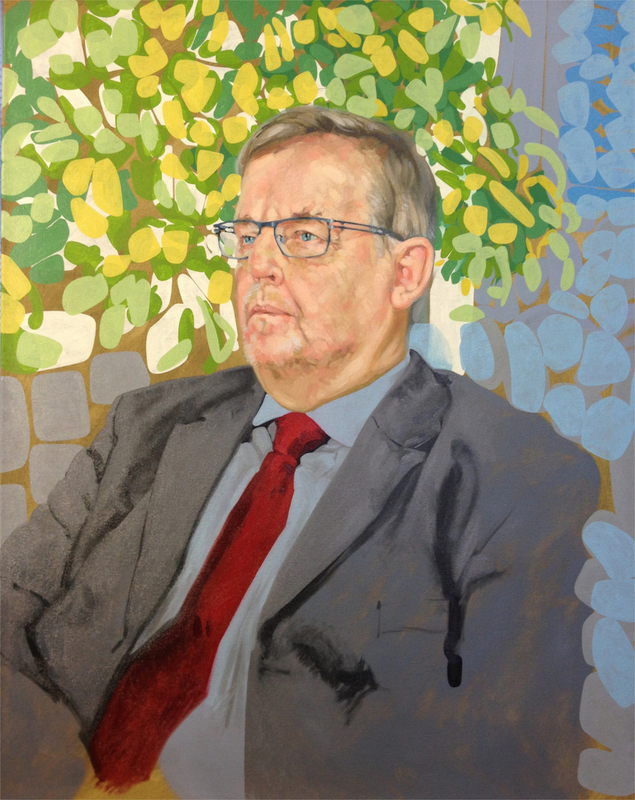 I could have stuck to the original plan, painting Hannu Pietilä into a painfully strained sitting position with arms askew, or, which seemed more aesthetically pleasing, to paint in the left hand and arm, creating a counter-focal point. The third session with Hannu Pietilä was for me to tidy up any colour and shape questions I still had, as well as to ask if he approved of the overall progression of the composition (not everyone has to be a fan of my abstracted organic shapes). The shapes and colour palette in the background was the biggest dilemma during the whole process. 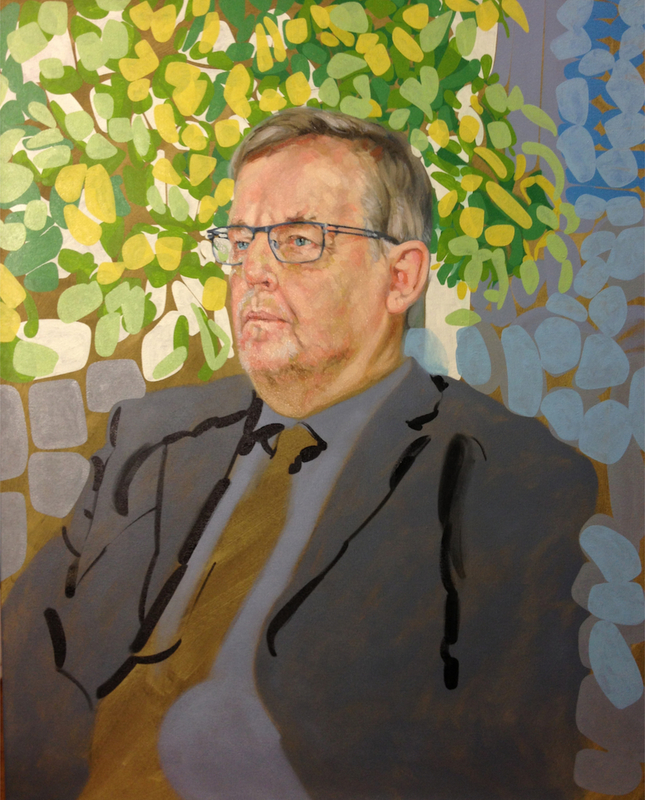 I wanted to keep it lively and colourful, but without it overshadowing the portrait. The object was to get the audience to focus on the model despite the window dressing. And then there comes the moment when you just have to put down your tools and back slowly away from the (presumed) finished painting.